What makes a jammie dodger biscuit great? 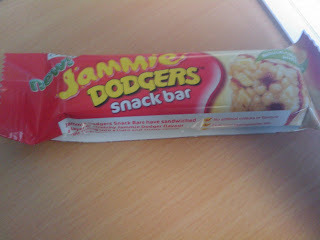 Well in my opinion it is the mix of sweet zingy raspberry jam and creamy crunchy biscuit. This bar has the jam, and it’s a good thick layer all the way through. I didn't really expect the crunchiness, after all it is a cereal bar, but I was disappointed that the creamy biscuit flavour wasn't very defined. Unfortunately the (rather tasty) layer of jam makes the bar a little unstable, and makes the whole consistency somewhat fragile! I’m desperately awaiting the "new improved recipe" sticker to appear on the label and for them to make this nice bar into a perfect bar with some added extra biscuit pieces! i'm dying for this to be sold in America! Couldn't we order them online from Marks & Spencer and have them shipped to the U.S.? I don't think M&S stock these - they are becoming hard enough to find in the UK.